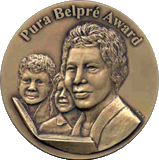 For Pura Belpré Award information, click here. Pura Belpré was a talented author and storyteller who wrote and re-interpreted Puerto Rican folk tales. As the first Puerto Rican librarian in the New York Public Library system she pioneered the library's work with the Puerto Rican community. Belpré was born in Cidra, Puerto Rico . There is a discrepancy in her date of birth, which is variously cited as February 2, 1899 , December 2, 1901 , or February 2, 1903. She graduated from Central High School in Santurce in 1919 and enrolled at the University of Puerto Rico in Río Piedras. Soon thereafter, in 1920 she interrupted her studies in order to attend her sister Elisa's wedding in New York. As it turned out, except for brief interludes, Belpré was to remain in New York for the rest of her life. Like many of the Puerto Rican women who came to New York at that time, Belpré's first job was in the garment industry. Her Spanish language skills soon earned her a position as Hispanic Assistant in a branch of the public library at 135th Street in Harlem. Belpré became the first Puerto Rican to be hired by the New York Public Library (NYPL). It was while working in the children's division that Belpré discovered her passion for storytelling, her love for children's literature, and her interest in librarianship. In 1926 she began her formal studies in the Library School of the New York Public Library. One of the courses that most inspired her was storyteller Mary Gould Davis' "The Art of Storytelling." As a course requirement Belpré wrote her first folk tale using a story she had heard as a child from her grandmother in Puerto Rico . This story, Pérez and Martina, a love story between a cockroach and a mouse, became the first Puerto Rican tale to be shared with children at a story hour in the public library. In 1929, due to the increasing numbers of Puerto Ricans settling in southwest Harlem , Belpré was transferred to a branch of the NYPL at 115th Street. She quickly became an active advocate for the Spanish-speaking community by instituting bilingual story hours, buying Spanish language books, and implementing programs based on traditional holidays such as the celebration of Three Kings Day. In her efforts to reach children and adults, she attended meetings of civic organizations such as the Porto Rican Brotherhood of America and La Liga Puertorriqueña e Hispana. Through Belpré's efforts, the 115th Street branch became an important cultural center for the Latino residents of New York City. Belpré also worked for a time at the Aguilar branch on East 110th Street in East Harlem where she initiated similar programs to expand library services to Puerto Ricans. In 1940, Belpré was invited to present a paper about her work with the Spanish-speaking community of New York City at the conference of the American Library Association in Cincinnati, Ohio. While in Cincinnati, Belpré met her future husband, the African-American composer and violinist, Clarence Cameron White, who was there conducting the June Festival of Music. They were married on December 26, 1943 . Belpré who had been working as a children's librarian decided to take a leave of absence in 1944 and at the end of the year resigned her position to go on tour with her husband and to devote herself to writings. 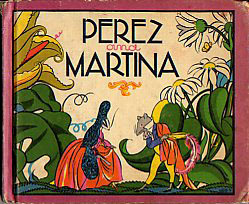 Belpré's first book, Pérez and Martina: a Portorican Folk Tale had been published by Frederick Warne in 1932. Her second story "The Three Magi" was published in 1944 as part of the anthology The Animals' Christmas by Anne Thaxter Eaton. Once she stopped working in the library, Belpré pursued her literary ambitions in earnest. During this period she compiled a collection of tales titled The Tiger and the Rabbit and Other Tales which was, in fact, the first English collection of Puerto Rican folk tales published in the United States. Consequently, she became a well-published writer, editor, and translator. 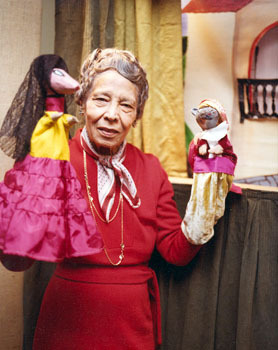 Although, she collected children's tales from many countries, her primary concern was the preservation and dissemination of Puerto Rican folklore. Throughout their lives together, Belpré and her husband maintained their residency in New York's Harlem. In 1960, White died of cancer and Belpré returned to part-time work in the library as the Spanish Children's Specialist. She worked all over the city wherever there were large numbers of Puerto Rican children. In 1968, she retired from this position, but was persuaded to work with the newly established South Bronx Library Project, a community outreach program to promote library use and to provide needed services to Latino neighborhoods throughout the Bronx . In addition to her work in the library and her literary activities, Belpré participated in numerous cultural and civic organizations during her lifetime. In 1939, for example, she was a member of the Association for the Advancement of Puerto Rican People. She helped establish the Archivo de Documentación Puertorriqueña, an early effort to collect original Puerto Rican documents, and she helped develop children's programs at the Museo del Barrio. It was largely through her efforts that the New York Public Library began to address the needs of the Spanish speaking community and to acquire culturally relevant materials. Pura Belpré died on July 1, 1982 leaving a rich literary legacy. Several of her books, long out-of- print, are finally being re-issued, and giving a new generation of children the opportunity to enjoy them.